King Street West is home to many restaurants. But now it can add the best steakhouse in Toronto to its ever-growing list with MARBL. Located at the corner of King Street West and Spadina Avenue, MARBL Toronto dazzles with sophistication. It adds a bit of elegance to a street filled with nightclubs and fast-casual eateries. Owner Peter Girges (the brains behind West Oak restaurant in Vancouver) wanted to infuse a bit of the chic Yorkville vibe into one of his own restaurants while still attracting all the Bay Street hustlers. 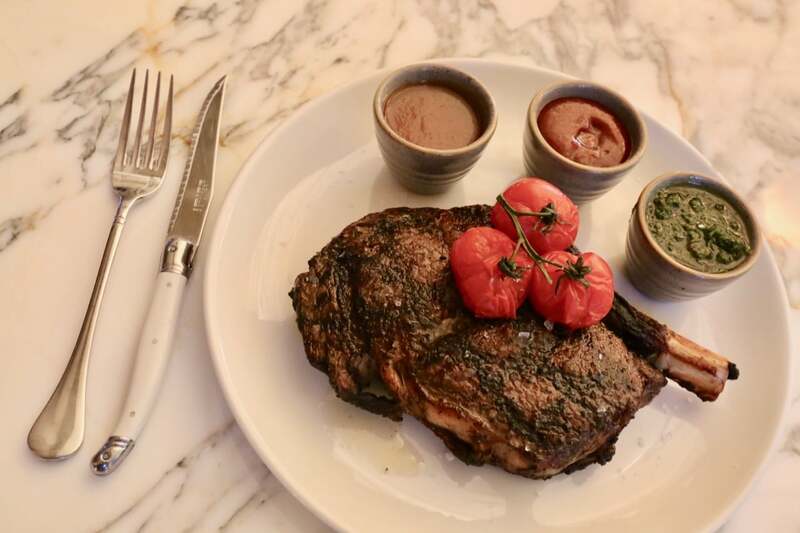 No matter who you are, MARBL restaurant is the perfect stop off for an after-work cocktail or to indulge in some extravagant steakhouse classics. 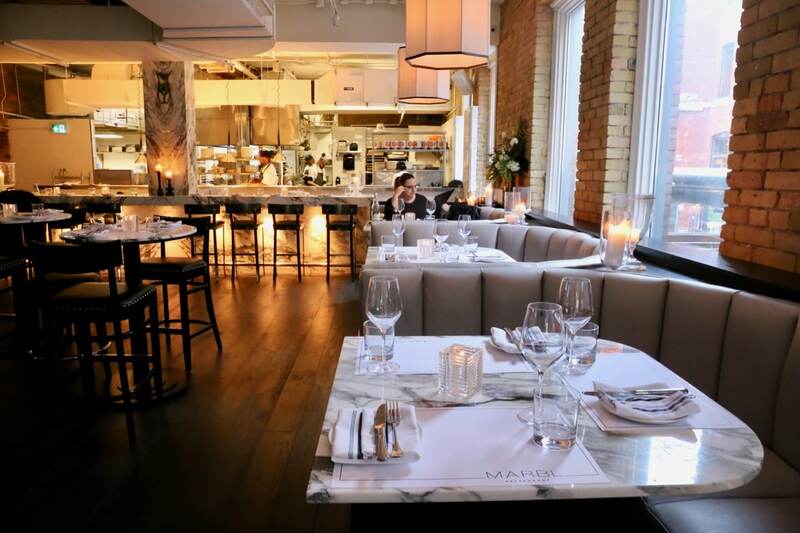 MARBL restaurant on King Street West is one of Toronto’s best new steakhouses. Taking over the former Drake and Susur Lee’s restaurant Fring’s in 2018, owner Peter Girges and his team did a complete overhaul of the 3,500 square foot space to make it into the opulent King West restaurant it is today. To coincide with the name, the Toronto steakhouse features marble pillars, tabletops, counters, decorative pieces throughout and gigantic windows, which give it a bright open feel. You’ll also find an open kitchen, with a view to watch Chef Ryan Morrison (The Glowbal Connection in Vancouver; Scarpetta in New York, Toronto and Beverly Hills) and his team in action. Sitting across the chef’s rail, there is a semi-private table for 10. The entire restaurant seats 180 or holds 200 cocktail style. Brandon Chandler, director of marketing at MARBL Toronto tells Dobbernationloves exclusively that he and owner Peter Girges sat down to discuss the name one day when MARBL came to Chandler. He remembers presenting the idea to Girges, explaining that MARBL was the perfect word association: it meant taking risks, it meant luxury and it would attract the restaurant goer who was willing to take all the marbles. This is how the MARBL restaurant was born. 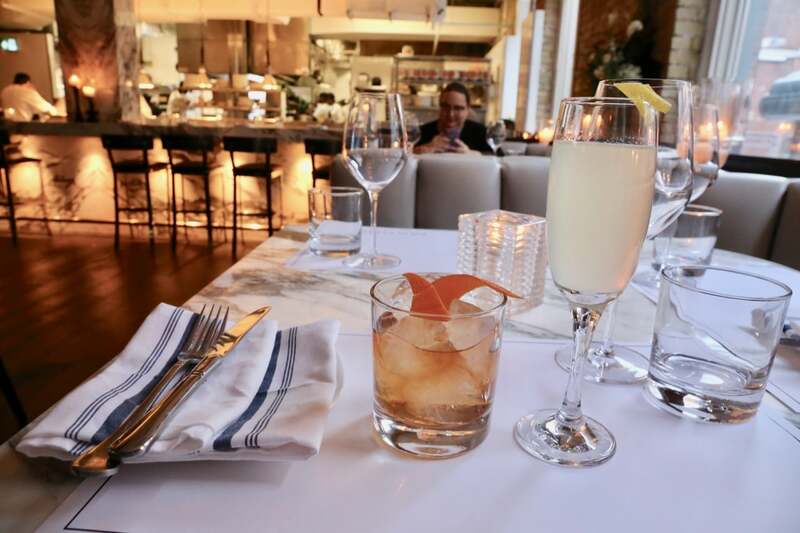 The cocktail menu at MARBL includes twists on old classics like the Manhattan and French 74. At the heart of MARBL Toronto, you’ll spot a floor to ceiling glass wine cellar, which accents the extensive list of exclusive and rare wines. Their wine list has been curated and offers a range of biodynamic wines and small-production wines from the U.S., Italy, and France. Glasses range in price from $14-$26 for a 5-ounce pour and pairs perfectly with the Toronto steakhouse offerings. The in-house cocktail program at MARBL Toronto was recently re-launched and has taken to focusing on familiar cocktails with an elevated twist. While there, we got to try the French 74 ($16) with vodka, prosecco, simple syrup, and lime juice and the classic Manhattan ($16) with 2oz Bourbon, 1oz Sweet Vermouth & Angostura Bitters. These classic cocktails were timeless and perfectly mixed, with a sophisticated flavour blend and beautifully balanced. If you’re coming to MARBL restaurant in Toronto for just a drink, you’ll be warmly welcomed at the bar. Actually, we recommend it. Although this may be one of the best steakhouses in Toronto, you will be blown away by the cocktail quality and wine selection. On second thought: it might even be worth taking a seat at the bar. 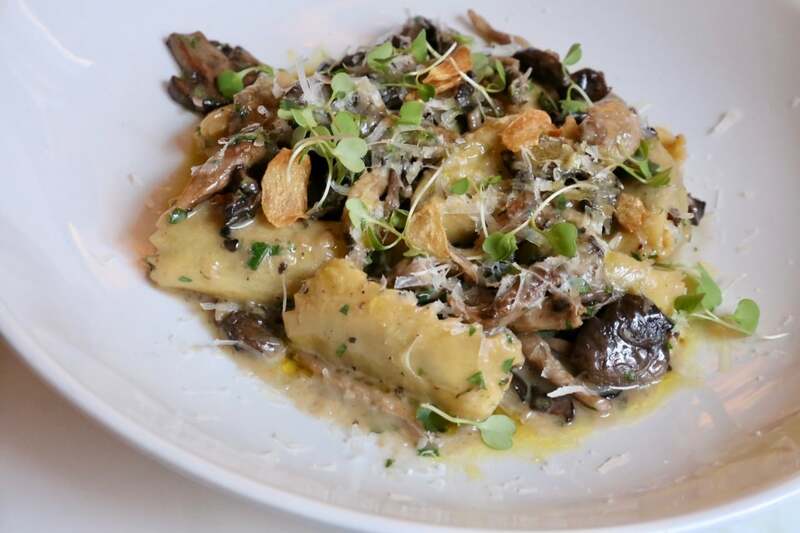 All pastas at MARBL Toronto are made in-house by Chef Ryan Morrison and his team. Led by Executive Chef Ryan Morrison, guests to MARBL can expect a fine-dining atmosphere with steakhouse classics including tuna tartare, Caesar salad, and, of course, a selection of steaks. Morrison began his cooking career in Toronto, before departing for the United States and working for the Scott Conant Management (SCM) hospitality group, as Chef de cuisine of Scarpetta locations across North America then eventually promoted to Director of Culinary Development for SCM’s family of restaurants. In 2013, Chef Morrison moved back to Vancouver to join The GLOWBAL COLLECTION as Assistant Corporate Chef. Morrison shares with Dobbernationloves that he and Girges had known each other for close to 13 years, before ever officially working together, sharing that his uncle worked for Girges prior to him. He felt like accepting the position of Executive Chef at MARBL in Toronto was like going to work for a family. The menu is split into four different sections: starters, entrees, grill a la carte and sides. While not listed, they do have an entirely separate menu for their desserts, so save room and don’t forget to ask about it. To experience the menu, in its entirety – we suggest ordering one dish from each section of the menu. For two people who are sharing plates, this is more than enough food – trust us! 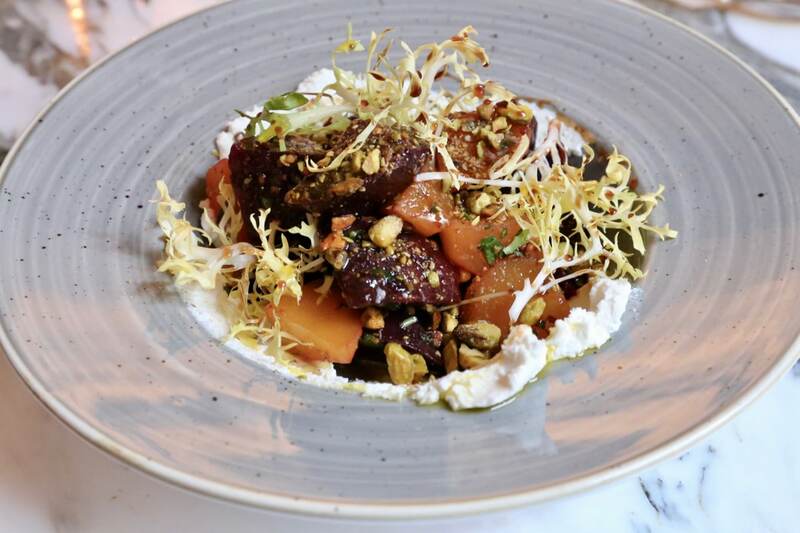 Beets with whipped goat cheese and pomegranate molasses make the perfect starter at Marbl on King West. 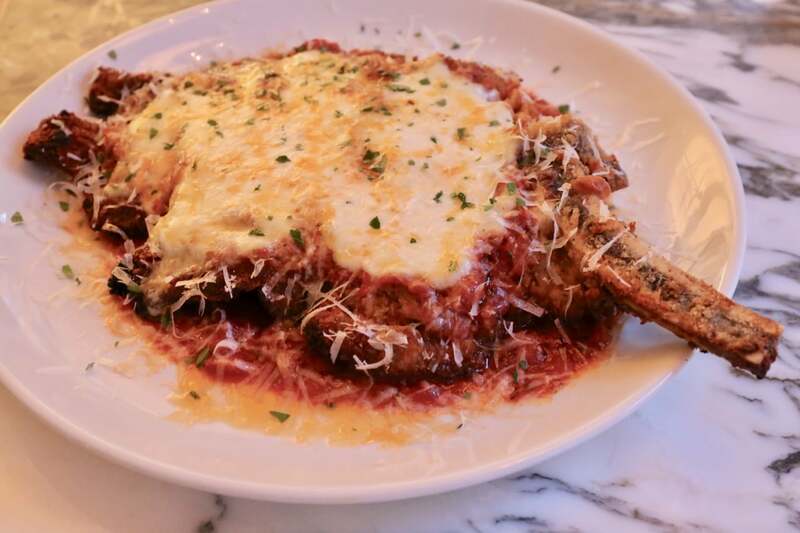 Veal Chop “Parm” made with burrata should not be missed at Marbl Toronto. 20oz Bone-In Ribeye comes paired with housemade A2 Steak Sauce and Chimichurri. 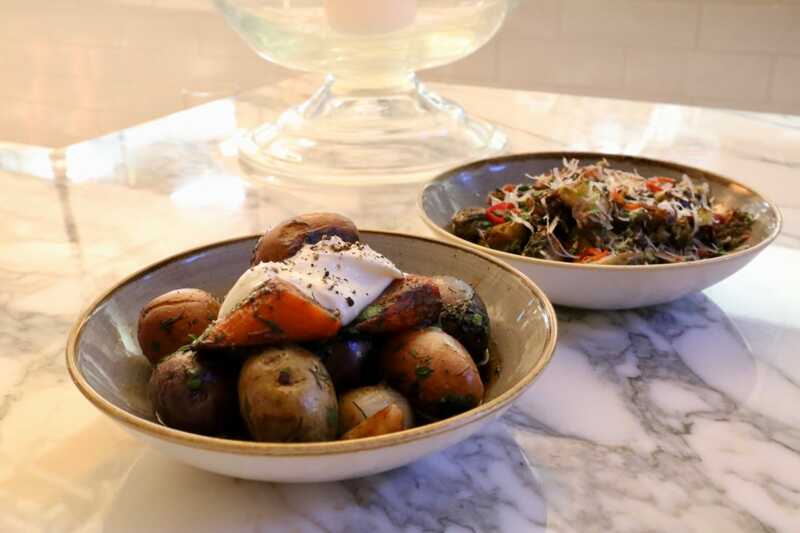 Steakhouse sides have been elevated at MARBL including Brussel sprouts and pot roast potatoes. 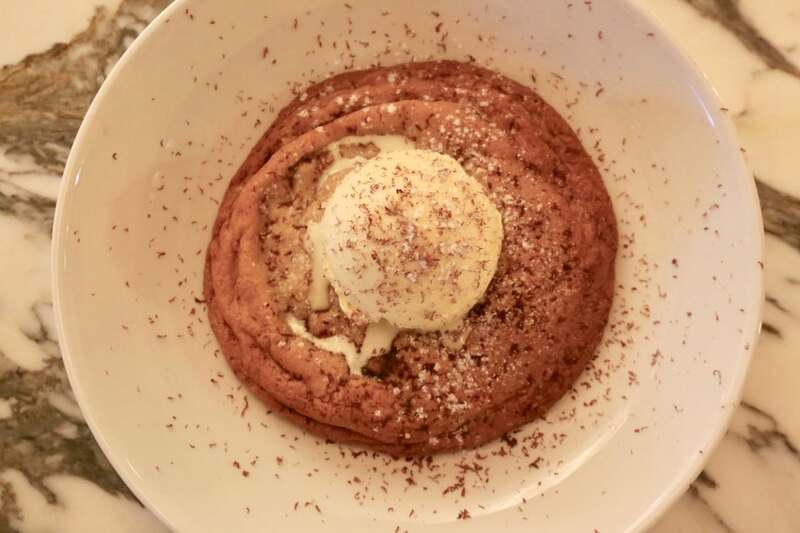 We couldn’t resist MARBL Toronto’s signature dessert: a chocolate chip cookie. If it’s champagne wishes and caviar dreams you’re looking for, Mademoiselle Champagne Lounge has it. Mademoiselle is the champagne lounge located on the lower level of the building. It seats 50 or holds 120 for receptions. Brandon Chandler, director of marketing gave an exclusive tour that showcased the high-end champagne lounge. Chandler explains that Mademoiselle is the long-lost lover to Pierre’s Champagne Lounge located in B.C. and another one of owner Peter Girges properties. 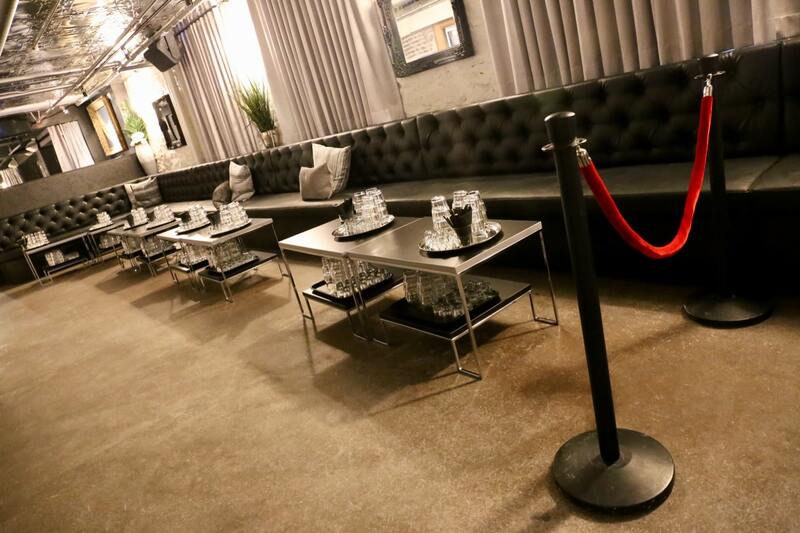 The lounge feels intimate, exclusive and high end, similar to Pierre’s. We think that it will be a hit during the Toronto International Film Festival (TIFF) circuit.